While the overall scope and design of the game are determined by us developers, the voting Republic (that’s you players) will have an opportunity to influence features as they are added and propose entirely new ones for consideration. As we finish a feature, we will call the Senate together to vote on the next Decree among the list of six. The Decree with the most votes will be developed, and the two Decrees with the least votes will be removed from the list. Developers will coordinate with certain members of the Republic to discuss and generate two new Decrees. These new Decrees will be placed back onto the list, to be voted during the next session. Tribune tier backers ($15 pledge) will be called to vote among the 6 Decrees. Tribune members have the ear of their Magistrate representatives, and will be able to propose new Decrees. Magistrate Tier ($30 backers) have the opportunity to work with the Developers in deciding which Decrees are voted on by the Tribune. Magistrates will vote amongst themselves to determine which Decrees will be voted on in the next session. They are the primary communication link between the development team and the player base. Members of the Dux Tier ($100 and above) will be able to use their VETO powers once. This gives them the power to stop a passed decree from being developed. A new Senate assembly will be called so that a new decree can be voted on. If a vetoed decree is passed for a second time, it may NOT be vetoed again. A: We want the Community to influence features in the game, but we already have a strong design in place for SRC. The Decrees that we add to the game are merely complimentary features — nothing that’s fundamental to the game itself. 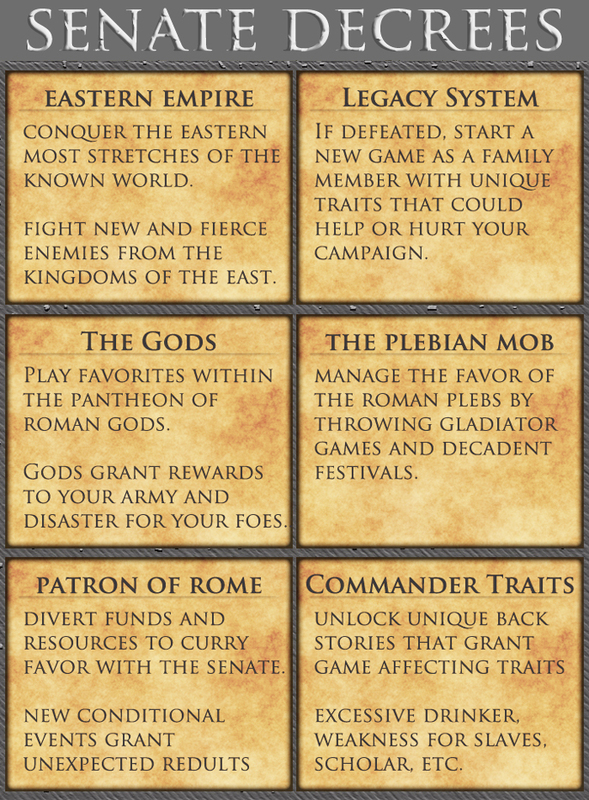 Think of Decrees as content updates in an MMO. When choosing which content to add, we want you to have a voice. Q: So those who fork over more money get to influence the game more? A: Well, yes. We are super serious about emulating the Roman Republic, nasty aristocracy and all. But rest assured, the game’s design will not be dictated by those who pay — merely, our most generous contributors will have a present voice and communication with our development team. Q: This sounds like too much for me. I just want to play the finished game. A: That’s no problem. This system is completely opt in and backing the project carries no obligation to participate in it. We have a strong vision for the game that will stay true to the gameplay promises we make in the trailer. While we hope you choose to participate in the Senate, we won’t punish you for not joining in.